I was born and raised in the Seychelles Islands in a culture of very mixed nationalities. My first sights of life were beautiful palm fringed beaches, olive skinned women, balmy nights and strange rites and rituals. It was these rituals and ceremonies, like a medicine man giving a healing, the Chinaman dispensing herbs, coloured ladies in costumes performing tribal dances, that stayed in my mind. Their magic and depth of understanding. It seemed so profound, so awesome. A new life in Australia, high school over, and off travelling to find me, my Truth. Met many interesting people, learned much about life and love. Made some worthwhile mistakes. Planted a couple of trees. Had many real experiences of giving and receiving. Felt what service really means. Became a dad. Figured out the power of humility and the unlimitedness of the human character. My journey then took me on to gain greater knowledge of the various types of Meditation. I practised Yoga, Crystal and Spiritual Healing and was attuned to Reiki Master. Past lives were challenging to learn but Psychometry was fun and demanded strong discipline. Was guided to be a Palm Reader and to read the Tarot Cards too. Then came an understanding of Astrology and Numerology. Did an array of classes on personal development, read many a book, studied counselling and attended dozens of lectures. Partook in Healing Lodges, Dance Circles, Meditation Retreats and met numerous notable messengers that I admired and respected. In 1986 my spirit called upon me to pursue a life as a professional Psychic Reader and Healer. I believe I have something to share. Now based in Cairns, I read for numerous overseas clientele and regularly visit southern cities to further my experience in this – what I call my passion. It is through my Readings, Workshops and Healings that I am most at Home. My interest in Psychic/Spiritual/Energetic matters has always been in the forefront of my being and as a youth was somewhat intrigued by the fact that I could see, feel, hear, smell and sense energy and that I had the ability to Tune in to people’s past and Future lives. I could not properly understand – until I got expert guidance. The focus of my services are to engage with you, to guide you to positive change and move forward with your life to better work / wealth opportunities, loving relationships, happy bodies and a higher level of spiritual growth. Unleashing your best possible future is my game. Mediumship is not my forte. My quest to develop my Gifts has taken me on to do much learning and then to Teach topics like Psychic Development, Numerology, Palmistry and Meditation. 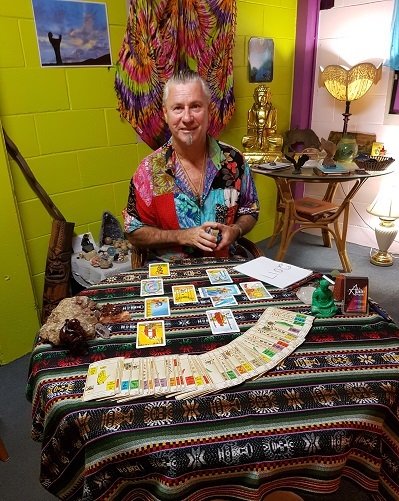 I have been attuned to Munay Ki (rites of heart opening of South American Curandero Shamans) and regularly practise Qi Gong, an energy form of East Asia, under the Mastership of Dr Daniel Houtman, to cultivate stronger energy field. I am a Reiki master and have studied counselling and learnt an array of modalities and facilitated a huge number of workshops, retreats and healing circles on a 27 year plus career of professionally guiding my community and these days my work goes internationally too. Meditation of various kinds are also one of my favourites. I practise daily and also attend various gatherings. I have travelled to many destinations in my seeking for more Wisdom and Knowledge. Have spent time in India at the ashram in the presence of the late Sai Baba. A powerful journey that words cannot describe. Time in Indonesia meditating in the mountains alone. Travelled through the South American Andes of Argentina and Bolivia taping into these awesome cultures. Spent time in Thailand and Laos and Cambodia relishing in the child like nature and discipline of the Buddhist monks and their humbleness. My other adventure was in June 2012 where for 2 months, I had a massive awakening in the jungles of Peru where with the guidance of the Shamans, I learnt about their medicinal plants and partook in various rituals and ceremonies. Experiences that goes way beyond human understanding from both the healing and psychic levels. A smart person once told me that wisdom is earnt. In February 2014, in the company of two trusted friends I headed off to the Amazon Jungle and the Andes of South America in Peru to take my spiritual knowing further through more connections with these universally conscious and powerful Shamans. They seemed to heal with great ease, whilst us the recipient goes through an immense process to clear emotions that are stuck deep within. The personal and physical discomforts are sometimes immeasurably hard. Nights were long. Time slow. Nourishment just a pass. Trust was learnt intuitively. Destiny revealed. I wanted their knowing, their secrets. Is it to Feel what is Real ??? Back much the wiser and happy to download and now understand why a smart person would say wisdom is earnt. I am so grateful to all and circumstances that created these unforgettable moments to happen. I am fully open to share my knowledge and wisdom with whoever wants to know and learn through my Readings, Healings, Workshops and Retreats. Looking forward to meeting you and us growing together. What next for this Spiritual Warrior? General maintenance of home, garden and body. Massive decision to become a Dad again. Some say crazy, others laugh, we rejoice. In mid 2015 with the Great Spirit in partnership we were blessed to welcome our gorgeous son. Life totally rearrange in anticipation of more growth and awakening through this journey. Took us through massive emotions highs and lows by as Love is the glue we survived and thanked. Creativity galore developed both in art and musically. Many a guru came to town and limited my spiritual practices to a couple of Tee Pee ceremonies and lots of meditation. Tapping into the Truth via silence and connecting to knowing without the noise of words. In a deep meditation a voice said it was “time to renew your contract with the medicinal plants”. Putting out to the Universe for what needs to happen to manifest. An invitation to an Organic Festival deep into the Brazilian jungle. No access to technology, electricity, clean water and gourmet food. Big plane, small plane, boat, bus, taxi and walk to a mind blowing experience into the heart of the Amazon Jungle in Brazil. Lazy days, meditation, organic food and connecting to the unbelievable forces of the Shamans and their medicine at the Huni Kuni gathering. Powerful ceremonies all night long. Creating new emotional space within self to welcome the new Me, the new Realizations and to sharing all of the wisdom acquired. Beauty all around, immeasurable time as if at a Birth and Funeral all at the same moment. I welcome you to come and share this blessing with me. Until my next journey on the Road to Nowhere – the Void. If you love this website, then please like it and share with all your facebook friends! Tablelands Folk Festival Health & Wellness Fair 2018 – Muchas Gracias ! Tablelands Folk Festival Health and Wellness Fair 2017 – Thank you ! Select which types of email you wish to receive.